The owner of Amanda’s Hyde Park Bridal discusses finding “the one”—and we’re not talking about a man. After interning at Glamour and Elle and co-oping for a bridal boutique, DAAP grad Amanda Cacaro saw an opportunity in Cincinnati for a unique bridal shopping experience. More than three years after opening, her namesake shop is a success. You were married in May 2014. What was dress shopping like for you? It was extremely difficult. Owning a bridal boutique comes with a lot of pressure. Because I graduated in fashion design, I thought it was fitting to design my own wedding gown. 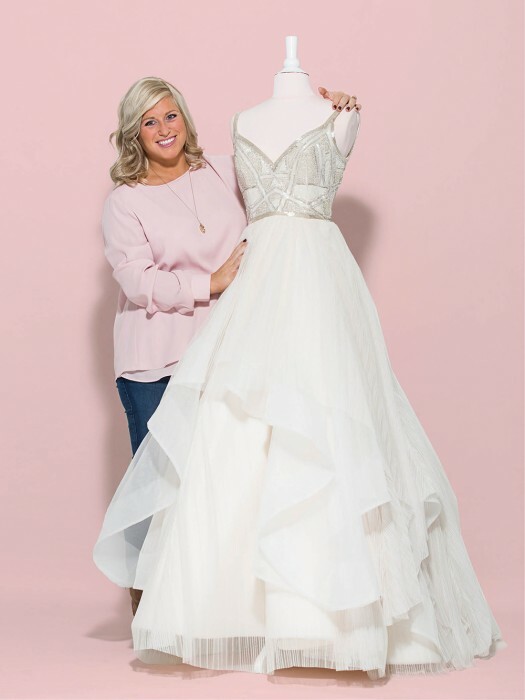 My favorite designer, Hayley Paige, worked with me to create my dream gowns. My husband loved the neckline of her Dori gown, so she created a mini version of it with pink accents for a reception dress. How many people do you recommend brides bring with them when they shop at your store? Three guests is wonderful. We feel any more than four can become overwhelming for the bride and the consultant. We understand the joy of inviting everyone, but it’s not in the best interest of the bride. How should a bride prepare for her appointment? Take a look at our Pinterest page and save gowns that spark your interest. Pictures always give us a sense of the look and feel you want on your big day. It’s important to know your budget. Giving us a gown-only budget helps because veils, belts, jewelry, and alterations can add a lot to the total cost of your bridal look. What is unique about the experience at Hyde Park Bridal? We give brides special touches like reserved parking spots, their name on the board out front, champagne, an individual social media post when they purchase a gown, and a shout-out on Facebook on their wedding weekend.